Your interest in geology may have started with rocks, but it certainly doesn’t end there. Geologists integrate their knowledge of biology, chemistry, physics and math to understand our planet’s past – and to predict its future. Studying geology engages you in the most serious issues facing our world. These issues include natural resource utilization, climate change, water shortages and more. You also will be prepared to search for ways to improve the quality of life on our planet. 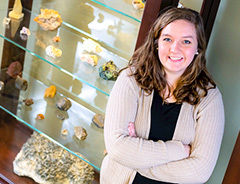 At St. Norbert College, you can pursue a major or minor in geology. When you major in geology, you earn a Bachelor of Science degree that prepares you either to enter the workforce as an entry-level geologist or to pursue graduate studies in geology or other fields. Among the most exciting opportunities you’ll find as a St. Norbert geology student is the chance to participate in field trips and digs in the United States and abroad. To complete your geology major, you’ll also participate in a summer field camp after your third or fourth year in the program. You can build on your understanding of the world’s geologic diversity through the college’s study-abroad program. 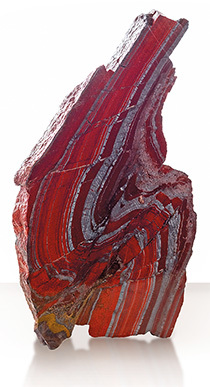 “We collected this sample of banded iron formation (BIF) from the Upper Peninsula of Michigan. It’s 2 billion years old. This is the rock that is the evidence for the first oxygen in our atmosphere. The red is hematite. The shiny black is magnetite. Then, some of the real bright red is jasper. Even though I’ve been studying rocks for 40 years, I still say, some of them are just doggone beautiful. It’s unusual for the National Science Foundation to provide funding specific to teacher-preparation in geology, especially at the K-8 level. But a $190,386 grant is giving a pilot group of students the chance to graduate with a thorough knowledge of what it means to do science in elementary education. What started with a prospector discovering a few bones protruding from the Tropic Shale of Utah ended seven years later with geology professor Rebecca (Schmeisser) McKean ’04 identifying a new species of prehistoric marine reptile. The plesiosaur, named Dolichorhynchops tropicensis, swam the waters covering the western United States some 90 million years ago.